Makes damaged, lackluster hair look glossy. Sensitive Shampoo was developed for particularly sensitive scalps and damaged hair. The combination of milk serum and Dead Sea salt ensures maximum effect. It helps damaged, lackluster hair look glossy and restores its stability, giving back its natural vitality. 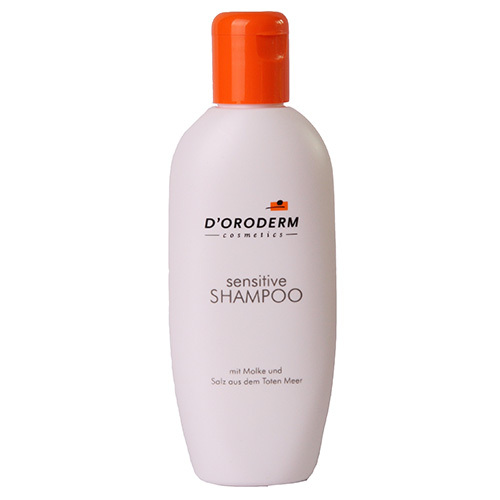 D´Oroderm Sensitive Shampoo is a highly effective product recommended by dermatologists for sensitive, easily irritated scalps prone to itching - ideal for daily use. Ingredients: Aqua (Water), Sodium Laureth Sulfate, Cocamidopropyl Betaine, MIPA-Laureth Sulfate, Lactis Proteinum, Decyl Glucoside, Glycol Distearate, Panthenol, Hamamelis Virginiana (Witch Hazel) Leaf Water, Panax Ginseng Root Extract, Maris Sal, Propylene Glycol, Glycerin, Aloe Barbadensis Leaf Juice Powder, Guar Hydroxypropyltrimonium Chloride, Laureth-4, Parfum (Fragrance), Citric Acid, Alcohol Denat. Sodium Benzoate, Potassium Sorbate.